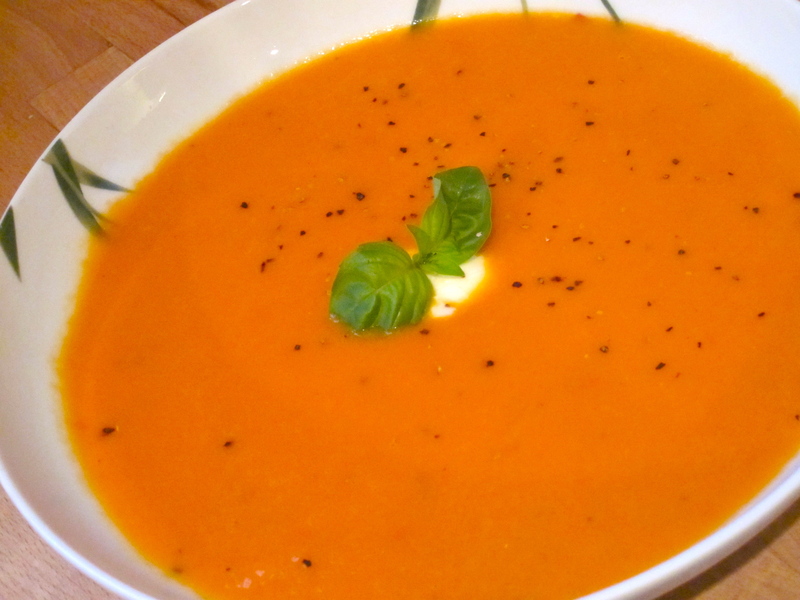 Today I like to share with you, my version of this ultimate classic: creamy tomato soup. Somehow this soup never bores, it is again very easy to prepare and utterly delicious. The mascarpone gives the soup the silky, velvety texture that makes it smooth and creamy. It is a bit richer yet so satisfying, a true comfort soup! I hope you will enjoy this recipe as much as I do. Heat the olive oil on medium heat in your stockpot. Sauté the onion and when they are about done add the garlic. Once translucent add the roughly chopped carrot, cherry tomatoes and the teaspoon of sugar. Toss the ingredients and add the can of chopped tomatoes. Stir gently and simmer for 10 minutes. Pour in your stock and bring to boil. Once boiling reduce the heat and simmer for 20-30 minutes. Turn off the heat and let the soup cool down for a few minutes. Then purée the ingredients with a hand blender in the stockpot or puree in batches in your blender. Return the soup to a clean pan and stir in the mascarpone thoroughly. Reheat but don’t boil and season to taste with (sea) salt and coarsely ground pepper. When ready to serve, ladle into bowls, garnish with a teaspoon of mascarpone, sprinkle with fresh basil and a turn of the pepper mill.